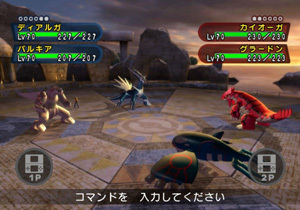 A Pokémon stadium battle game designed for the Pokémon Diamond & Pearl versions. Either rent a team of Pokémon or transfer your own from the DS games and battle through a series of computer controlled opponents in 3D. Create a trainer and customise them in the menu. You can win new outfits and accessories by winning Poké-Coupons in battles. Pokémon Battle Revolution is the first Wii game to use the Nintendo Wi-Fi Connection and wireless DS connectivity. There are two online options for either battling with a friend, or against a random online opponent.